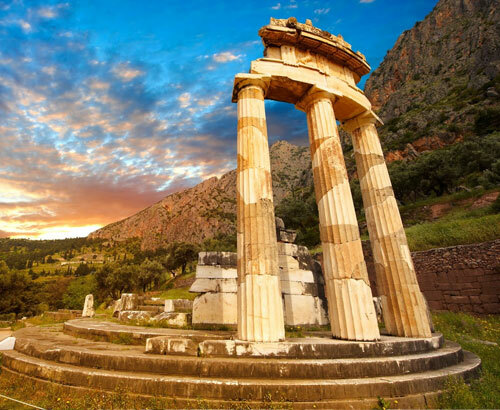 see all the famous sites of ancient and modern Athens on this comprehensive morning tour. Offering a perfect overview of the city, this guided half-day tour, the only one which includes headphone system will help you get your bearings if this is your first visit to Athens. We start with a photo stop at Panathinaikon Stadium where the first modern Olympic Games took place in 1896. It is the only stadium in the world that is built out of white marble. We then proceed, passing by Zappeion and The Temple of Olympian Zeus. We will then pass the Athens Trilogy which includes the University of Athens, the Academy of Athens and the National Library. We Continue passing by the National Garden, Hadrian’s Arch, St. Paul’s Church, The Parliament, The Tomb of the Unknown soldier, Schliemann’s House (Numismatic Museum), Catholic Cathedral, Old Parliament, Constitution Square, Russian Orthodox Church, and finally the ACROPOLIS where we will visit Propylaea, Temple of Athena Nike, Parthenon, and the Erechtheion with its Porch of Maidens). the ACROPOLIS museum. We skip the lines of the new museum and proceed to see the main attractions such as votives, artifacts of everyday life, statues from archaic period, Caryatids, and of course the Parthenon hall with the metopes, the pediments and the frieze that will amaze you. Evening free or optional Cape Sounion or Athens by Night tour. Accommodation in Athens. optional tour. This city more than lives up to its reputation as being one of the most attractive of the many cities of the Mediterranean! It can satisfy the wishes and demands of a diverse variety of visitors from all over the world, while still providing enjoyment and satisfaction to its permanent residents. It is certainly not a matter of coincidence that it has been the center of Crete for so many centuries, and continues to be so, thanks to an abundance of sightseeing attractions, its joyous way of life, and the legendary hospitality of the Cretan people. For inquisitive visitors, it is important to note that, in Heraklio, there are to be found and admired the oldest monuments in Europe. It is here where the first roots of the most ancient civilization in Europe were planted, a testimony for Western civilization, as we know it. It is here in Heraklio that Zeus, the God of Hospitality, fell in love with Europe, a most beautiful princess, from whom and whence the Minoan Kings were born, along with those wise mythical figures who laid the foundations for and instituted the first civilized society on our Continent. An outstanding archaeological museum and the magnificent excavations at Knossos will certainly testify to that fact. The famous Qretaquarium, the old Town and its local market or Visit a local winery. - Half-day City tour of Athens with new Acropolis Museum (organized), with English speaking guide + entrance fees and the transportation from/to hotel.